A look at the HP Chromebook 11-inch G5, a stylish laptop with up to 12.5 hours of battery life. The Chromebook™, the cloud-centric laptop that connects to the Internet and runs Google’s Chrome™ operating system, is getting a reboot this fall. The affordable, bare-bones devices are starting to take on some higher-end features, to help boost their usefulness for students, road warriors and anyone whose work depends upon being ultra-mobile, browser-based and ability to cloud compute. 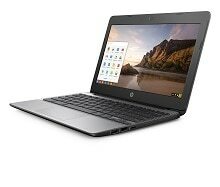 Today HP announced the Chromebook 11 G5 with an available touchscreen. With a redesigned chassis, the Chromebook features a slimmed-down design with a narrower display bezels, thinner and lighter dimensions than previous generations, and promises a game-changing up to 12.5 hours of battery life1(based on Google Chrome OS™power_LoadTest)— at a budget-friendly starting price of $189. The release comes on the heels of the HP Chromebook 13, a higher-end device launched in April. It touts a 13.3-inch diagonal screen with a QHD+ (3200 x 1800) resolution IPS display, and it was the first Chromebook to use the sixth-generation Intel® Core™ M processor2 and enable docking station compatibility3. The new HP Chromebook 11 G5 is the first of HP’s 11.6” diagonal Chromebooks to offer a touchscreen—an inviting new experience for the many touch-enabled Chrome and Android™ applications in the Google Play™ Store that is planned to be compatible with Chrome OS™ later this year. Although feather-light starting at just 2.51 lbs., the 11 G5 speeds through spreadsheets, videos and Hangouts with the power from an Intel® Celeron® N3060 processor that quickly launches apps, allows for speedy web browsing, and efficiently manages the battery for up to 11 hours on a touchscreen and up to 12.5 hours on a non-touchscreen device, based onChrome power_LoadTest. HP’s expansion of its Chrome OS lineup—the family includes the Chromebook 11, Chromebook 11 EE, Chromebook 13 and Chromebook 14— comes at an inflection point in the market. For the first time ever, Chromebooks represented a larger portion of market share than Apple® Mac® computers in the U.S. during the first quarter of the year, according to data from IDC . The research firm pegs U.S. Mac shipments to be around 1.76 million in the first quarter, with a hair fewer than 2 million Chromebooks sold during that period. In addition to their astronomic growth in the market, more big changes are ahead for Google’s OS, which is expected to enable apps from the Google Play Store later this year. The move, which could bring some 2 million Android apps to Chrome users in more than 40 countries, is expected to be “a huge advantage for Chromebooks going forward,” according to a report last month on tech news site The Verge. With the addition of the Google Play Store on Chromebooks, these devices currently meet the needs of students and teachers. Android apps on Chromebooks will make their experiences even better. Engineers at HP took feedback from teachers and students using Chromebooks in the real world to refine the next generation of devices. Specifically, they aimed to make the latest version of the thin and light Chromebook 11 G5 more durable and user-friendly for students than ever before, according to Wu. One version of the device comes with an optional HD IPS touchscreen panel protected by Corning® Gorilla® Glass NBT™, which reduces reflection and is damage-resistant to help resist handle swiping, tapping, and accidental bumps. The IPS panel with wider viewing angles enables a more collaborative environment for group discussion when students share a single screen, making for a more interactive learning experience in the classroom. The HP Chromebook 11 G5 is available through channel partners starting in July and set to hit retailers’ store shelves in October.